The data is collected with an instrument designed and manufactured by the ICE/IEEC-CSIC, the GPS Open Loop Differential Real-Time Receiver (GOLD-RTR). Nogués et al. 2007 describes the details of the GOLD-RTR. The receiver was built on FPGA, based on digital hardware circuitry. This dedicated hardware receiver contains 640 complex correlators organized into 10 channels of 64-lags each, computing 1 complex DM per channel simultaneously. The system can be programmed to correlate signals from 10 different satellites at each correlation channel to obtain DMs in different geometries, or it may be programmed to process the same signal in different channels under different frequency shifts (thus obtaining DDM). Or any combination of both, requiring up to 10 channels. The instrument provides complex waveforms of 64-lags each, every millisecond, what we call complex raw data. The receiver in its original shape has three radio front-ends, allowing the instrument to receive the signal from up to three different antennas (or signal components of an antenna, such as a given polarization, see Figure 1). The correlation channels are then programmed to be fed from any of the front-ends. The programming of the correlator consists of a file indicating when and how the configuration is changed. The changes can occur as often as every second, meaning that every second (or longer intervals), the user can decide the characteristics of each correlation channel: which satellite (PRN number or relative, sorted by SNR or elevation angle); from which front-end (meaning from which antenna and polarization); ancillary delays; and ancillary Doppler frequencies (to produce slices of the DDM). One of the front-ends, identified as Link-1, must always be fed by an up-looking RHCP antenna, for navigation and timing. Its signals are processed by a commercial Novatel navigation card installed inside the GOLD-RTR. The information produced in real-time by this card is used by GOLD-RTR for keeping time and also to properly model the replicas of the open-loop correlations (range and frequency models applied to the signal replicas to correlate with). The physical meaning of each Link-Number (antenna/polarization), can be therefore different for each campaign/flight. The antennas/links configuration is given for each campaign in its campaign summary page. The integrated data gives the polarization for each waveform (netCDF variable Polarization), but the raw data provides the link number solely. where currently Nlags is 64. Both the complex raw data at 1 millisecond sampling cadence, and the 1-second integrated geo-referenced data, are provided on separate netCDF files. The integrated data consist of the incoherent sums of 1000 waveforms, each coherently integrated for 1 ms; together with receiver/specular/transmitter positions, inertial navigation information, vectorial offsets between antennas, and some correction delay models. In 2009, three improved copies (units from now on) of the GOLD-RTR were manufactured, the GOLD-RTR II. Besides enhancing aspects of the noise and isolation of the channels, a noticeable difference between the first and second generation of GOLD-RTRs is the presence of 8 slots for allocation of up to 8 front-ends in a single GOLD-RTR II unit. Table 1: Instrumental parameters of the GOLD-RTR. 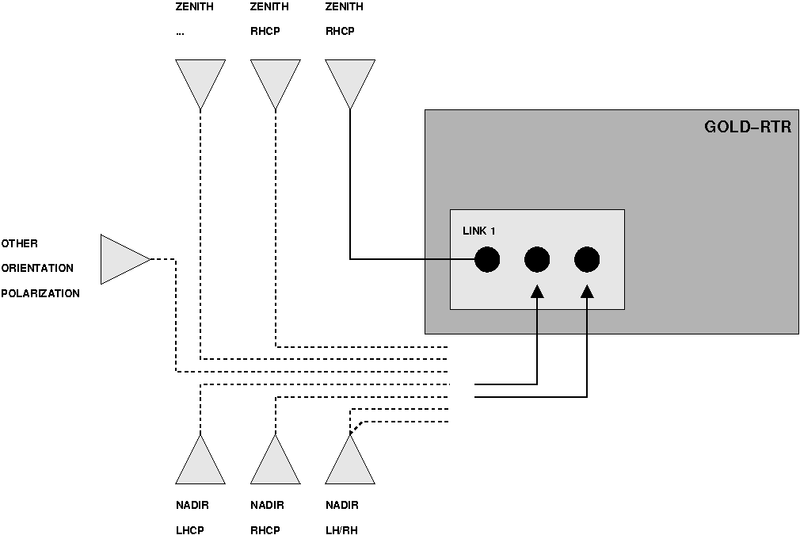 Figure 1: The so-called Link-1 of the GOLD-RTR must connect the first radio front-end to an up-looking RHCP antenna for navigation. The signal of this antenna feeds an internal Novatel commercial navigation card installed inside the GOLD-RTR, used for navigation and to provide timing and the geometric parameters required to compute the delay-models of the open-loop correlation channels. The rest of radio front-ends (two more in the original GOLD-RTR and up to 7 more in GOLD-RTR II) can be feed by any other antenna (pointing down/up or towards other directions), working at any polarization (RH/LH, vertical, horizontal...). The functionality of the GOLD-RTR, goes therefore beyond GNSS-R measurements, but other applications could be performed (radio-occultation from horizon-looking antennas, attitude control from a set of up-looking antennas, etc). The correlation channels are programmed to work with signals from either link, with an updatability of every second. The GOLD-RTR campaign user must know which antenna/polarization is connected to each Link when programming the correlators.